An alligator is a pet only suited for the experienced reptile keeper who's willing to put in a lot of time, effort and money. While babies are relatively easy to house, requiring only a 75-gallon aquarium or so, adolescents and adults, which reach over 12 feet in length, require enormous enclosures that are often made out of the same material used in wire dog kennels. However, you can keep the babies in tanks like any other reptile. Setting up these tanks can be a difficult task; they must be filled two-thirds of the way with water. If you have a baby alligator and want to keep it in a tank until it's big enough to be put in a larger pen, setting up the tank properly requires much patience and care. Fill the tank about a third of the way up with warm water and add dechlorinator. The dechlorinator, which comes in a liquid form, will remove any harmful chemicals commonly found in tap water. Layer the silica sand on the bottom of the aquarium and pack it on one side, creating a bank and land area that reaches out of the water. Think of it like creating a little beach in the tank. This land area should cover about one-third of the tank while the other two-thirds should be aquatic. This is where your alligator will go to bask. Soak the large rocks in a bucket of water with one-third of a cup of bleach for 15 minutes, then remove the rocks and boil them for ten minutes to remove any germs or bacteria. Layer the rocks at the bottom of the aquatic portion of the tank, over the sand. These will provide your baby gator with good footing when it moves around. Install the canister filter. This filter sits outside of your tank and takes in water via a flexible intake tube, filters it, then expels it via a flexible output tube. The specific instructions will vary according to model, but most involve running the intake and output tubes down the walls of the tank and into the water. Install the water heater. Alligators need water temperatures around 75 F, and a heater like the type used for aquariums should have no trouble maintaining it. Most heaters are long glass tubes that can be placed horizontally in the water. They must always remain below the water line when powered on, or the glass will crack. Place plants and logs around the tank. 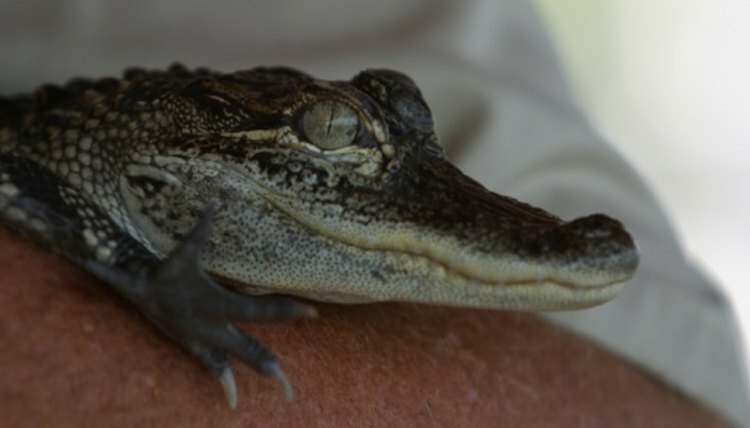 The natural aesthetics will not only make the tank look nicer, but also help the baby gator feel more at home and give it places to climb or hide if it feels up to it. Cover the heater with a log so that the baby gator cannot gain access to it and burn itself, as the heater will naturally get very hot. Install a thermometer, preferably a digital one. The air temperature of the enclosure must remain between 75 F and 85 F. Most thermometers are battery operated and can be attached to the tank via suction cups. Place the screen lid over the tank. The screen lid should be designed specifically for reptiles and capable of resisting extreme heat. The lid should be 18 inches wide by 48 inches long to accommodate the size of the 75-gallon tank. Screw the 150 watt heat bulb and UVB bulbs into dome lamps and place the lamps on the screen lid, face down, over the land area of the tank. Turn on the lamps. This will provide the area where the alligator can bask under the hot bulb and absorb UVB light, which simulates natural sunlight. Screw the 75 watt bulb into another dome lamp and place it face down over the water area of the tank, then turn it on. This weaker bulb will help keep the aquatic area of the tank warm, but not too warm, as the gator needs a cooler side of the tank as well. Change the water in the tank at least twice a month, as alligators will defecate in it, spreading germs and bacteria. Alligators grow by about a foot per year during the first few years of life, so this tank should only be temporary. Upgrade the tank size to 120-gallons after a year. After that, the gator will need to be moved to a pen, as no commercial tanks are large enough to house it. Keeping the alligator in a tank that's too small can seriously deform the gator or make it sick. The water area of the tank should optimally be about twice the size of the gator's length. For example, a juvenile 9-inch gator needs a water area at least 18 inches long.